The AM Chickadee is a one-tube Amplitude Modulation (AM) transmitter with an unmodulated output power of around 250 mW (1/4 W). This project is a descendant of the Little Chickadee Morse code transmitter. The transmitter can be used for two purposes. First, it can be used to transmit a music signal that can be picked up by a nearby short-wave radio. I use it for listening to music and for testing some of my antique short-wave radios. Second, it can function as a low power (QRP) ham radio AM phone transmitter for use on the 80 or 40 meter ham bands. When used as a ham radio transmitter, the range will typically be very short due to the low power. It could be used for contacting other ham radio operators in the same town or long distance operation when propagation conditions are favorable. 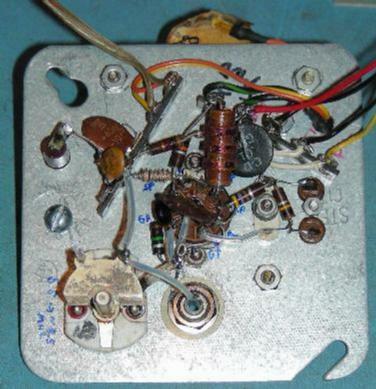 The AM Chickadee can be operated on frequencies outside of the ham bands by connecting the transmitter to a 50 ohm dummy load, a short piece of wire connected to the hot end of the the dummy load will provide a few tens of milliwatts of radiation, which is plenty of signal for pickup on nearby radios. When transmitting music, it is important to pick a clear frequency, this will prevent other stations from interfering with your signal and will also ensure that you don't interfere with any other users of the frequency. Many older short wave radios cover the 9.3 to 15 Mhz frequency range. It is best to stick to the lower end of this range since older receivers tend to be easier to tune in at the lower frequencies. The 31 Meter short wave broadcast band from 9.4 to 9.9 Mhz is a good range of frequencies to use. A single 6U8A tube is used for the RF signal path, it contains a triode and a beam pentode in a 9 pin envelope. The triode section of the 6U8A is used as a tuned crystal oscillator stage. The triode's tuned plate circuit consists of L1, an inductor, C1, a fixed-value silver mica capacitor and VC1, an air-variable capacitor. Inductor L1 can be one of several types of coils, depending on the transmit frequency. L1 and the optional C1 have been installed outside of the main box on an insulated RCA jack, this allows different tuned circuits to be plugged in for operation on multiple frequencies. Keep in mind, L1 and C1 are electrially "hot" and should be insulated properly. I have used two junk-box crystals that fall on useful short-wave frequencies, 7.302 Mhz and 10.88 Mhz. For 7.302 Mhz, L1 can be 34 turns of #26 enameled copper wire wound on a T50-2 toroidal core. For 10.88 Mhz, L1 can be 17 turns on the same type of core. C1 is not required for either of those frequencies. 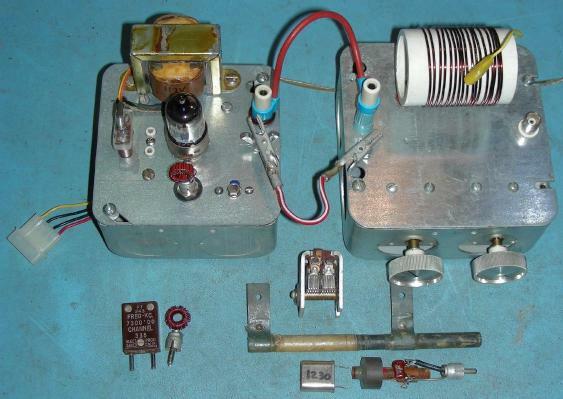 The transmitter has also been used with a 1.23 Mhz crystal, which is in the AM broadcast band. For AM BC band operation, L1 can be a pi-wound AM broadcast band oscillator coil and C1 should be around 150 pF, depending on the coil. The output of the oscillator/amplifier triode is lightly coupled to the control grid of the 6U8A pentode through a 20 pF DC blocking capacitor. The pentode is wired as a class A RF amplifier, the DC bias current of the pentode is set by the 470 ohm cathode resistor. The output of the RF amp goes through a VHF parasitic snubber consisting of ten turns of wire around a 10 ohm resistor. Plate voltage is supplied to the pentode through a 2.5 mH RF choke coil, this isolates the RF from the power supply. Screen voltage is supplied by a 10K current-limiting resistor. The output signal from the pentode stage is fed through a modular low-pass pi filter that matches the tube's high output impedance to the 50 ohm antenna impedance. The filter also greatly reduces the harmonic emissions from the transmitter. Note the 2.5 Mh "safety choke" on the output of the low-pass filter. It grounds out any high voltage DC components that may develop on the output circuit. The safety choke also allows the output signal to be monitored with an oscilloscope. A medium power audio signal comes from an external amplifier, it is used to drive one of the 3.15V windings on the modulation transformer, which is a re-purposed 6.3V 1A center-tapped filament transformer. The high-voltage line side of the transformer is inserted in series with the pentode's B+ line to produce the AM modulation. An optional 22 ohm load resistor can be placed across the transformer's primary to produce a more resistive load for the audio amplifier, this may improve the audio fidelity, depending on the amp used. A converted Hammond AO-44 amp with a load resistor has worked will with the transmitter. When using a tube modulation amplifier, the two transformers in series will have a low-pass effect and may introduce phase distortion into the audio signal. Despite this, a push-pull tube modulation amp driving the modulation transformer produces a very nice souding AM signal. If you can find one, a push-pull interstage transformer can also be used between the tube audio stage and the transmitter's pentode plate circuit. That would require changing the typical speaker-side negative feedback circuitry used in many push-pull tube amp designs. Solid-state amplifiers will also work well as a modulation amplifier, they have the advantage of only requiring one transformer in the modulated audio path. A solid-state car stereo amplifer that was scrounged from a defunct cassette player has worked well as a modulation amplifier. The power supply is not shown, it should supply anywhere from 175 to 275 Volts DC at 30 mA and 6.3 Volts AC at 1 Amp. The higher B+ voltages will produce slightly more RF power. This power supply is a good match for the transmitter. The supply is operated on the 320V setting and the transmitter loads the B+ voltage down to around 225V, producing 250 mW of carrier power and 1W of peak envelope power. The transmitter was constructed on the cover plate of a standard 4"x4" electrical utility box, the plate had a knockout in the center that was perfect for mounting the nine pin tube socket. A few extra holes were drilled into the plate for the tube socket screws, the terminal strips, the output connector, the crystal socket(s), the oscillator tuning capacitor and the modulation transformer. A standard romex cable clamp can be used to secure the power and modulation wires to the box. Keep all wiring as short as possible to lessen the possibility of creating spurious oscillations and other problems. Note that two crystal different crystal sockets (FT-243 and HC6/U) were wired in parallel, this allows multiple crystal types to be used in the transmitter. The modular antenna tuner / pi filter was built onto a 5"x5" electrical utility box cover plate. It is the same device that was used for the Little Chickadee transmitter and features pluggable 80 and 40 meter coils. The variable capacitors are mounted inside of the filter box. The two double-section variable capacitors in the pi filter were scrounged from old radios. For operation on 10.88 Mhz, the tank coil was tapped at 9 turns from the input side and the tap was shorted to the output side. Two mini-switches were placed between the sections of each of the variable capacitors to give two capacitance ranges, only the smaller capacitor section is used when the switch is off. The switch on the plate side of the tank circuit should generally be left in the off position. The output from the pi filter goes to a BNC jack that connects to an antenna or a dummy load such as a 50 ohm, 2 Watt carbon composition resistor. When operating the transmitter on the AM broadcast band, the PI output filter can be replaced with a ferrite loopstick antenna that is connected between the output side of the 1nF pentode plate capacitor and ground. The loopstick consists of around 75 turns of wire on one end of a 3/8" x 5-1/4" ferrite rod. A 20-150 pF variable capacitor was placed in parallel with the loopstick coil and should be adjusted for a peak reading on the pentode plate circuit as seen on an oscilloscope. The loopstick antenna is sufficient for reaching nearby AM radios. If a greater coverage distance is desired, wrap a few turns of wire around the loopstick, ground one end of the new coil and connect the other end to a longwire antenna. The triode circuit's tuning capacitor should be adjusted so that the circuit resonates at the crystal frequency. Initial resonance can be set by lightly coupling an oscilloscope probe to the oscillator plate circuit via a 5pF capacitor and tuning for the maximum signal. Final tuning should be performed by tuning the triode circuit while peaking the output power produced by the pentode circuit. Connect the transmitter to an SWR meter and connect the output of the SWR meter to an antenna or a dummy load. A resonant dipole is a good choice for an antenna. Connect the power supply and modulation signals to the transmitter. Apply power and turn the transmit switch on. Adjust the pi filter for the best forward power on the SWR meter. The capacitor on the tube side of the pi filter should be adjusted for peak forward power and the capacitor on the antenna side should be adjusted to the point where forward power just starts to drop off. The easiest way to set the level of the modulation amplifier is to monitor the signal on a good quality radio and adjust the level to a point below where distortion is heard. If you have an oscilloscope, connect it across a dummy load connected to the antenna terminals and observe the waveform. The waveform should be smooth and should never stay at the zero level. An oscilloscope may also be used in X-Y mode to create a trapezoid pattern, which is a common way to monitor an AM transmitter. Connect the X axis to the modulation audio and the Y axis across the antenna terminals, adjust the X and Y gain for the largest display. The transmitter produced a very linear pattern when this test was done. Most modern music sources produce a stereo signal. Two line-level audio signals can be mixed together to create a mono signal by feeding them both through low-value resistors into the modulation amp's input. I used two 2K resistors, but anything in the range of a few hundred ohms to about 10K should work. An optional audio compressor can also be used in the signal path, this can help to insure that clipping never occurs. It is best to compress both channels with a stereo compressor, then mix the two compressed signals. If you notice a lot of hum on the received signal, the transmitter's output may be getting coupled to the AC power line. The best way to avoid this problem is to locate the transmitter away from nearby house wiring and power cords. If an external antenna is used, it should be located away from power wiring. The low-pass filter's tank coil can also couple RF into the power lines, this problem can be remedied by mounting the entire filter in a shielded metal enclosure. Receiver antennas should also be kept away from all power wiring. With the transmiter turned off, the receiver hum can sometimes be minimized by rotating the receiver or external receiving antennas. A ham radio license is required to transmit a voice signal in the ham radio bands. If you are broadcasting a low-power music signal, it is advisable to stay out of the ham bands since you may cause interference. If you want to operate the transmitter in the short-wave broadcast bands, a number of common crystal frequencies are available. Here are some readily available crystal frequencies: 5.9904 and 6.0 Mhz crystals are in the 49 Meter band, 7.3728 Mhz crystals are in the 41 Meter band, 9.8304 Mhz crystals are in the 31 Meter band and 11.981 and 12.0 Mhz crystals are in the 25 Meter band. These crystals are commonly available from mail-order suppliers such as Mouser, Digi-Key and Newark. Bry Carling, AF4K sells a wide variety of surplus crystals, eBay is also a good source for crystals. It is possible to substitute several other types of tube in place of the 6U8A. 6GH8 and 6EA8 tubes have the same pinout as the 6U8A and both should work in this circuit with no modifications. Higher power triode-pentode tubes such as the 6AW8A and 6BM8 could also be used in this circuit with the appropriate pinout changes, lower value cathode bias resistors could be used on the pentode circuit of these tubes for higher power. One could also use separate tubes in a similar circuit to produce higher power levels. 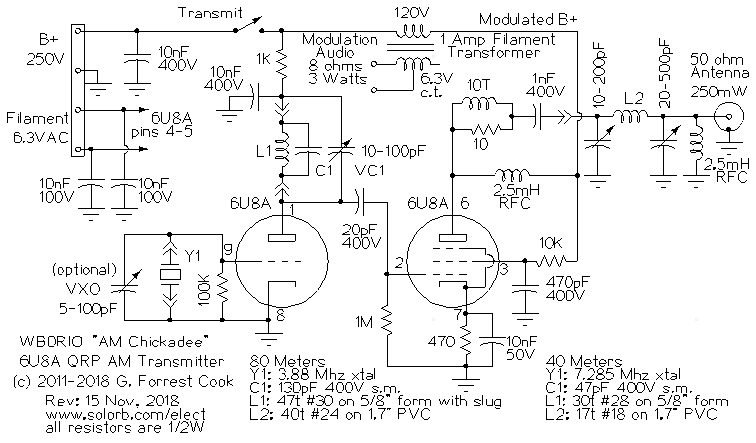 A 6C4 oscillator tube driving a 6V6 or a 6BQ5/EL84 should be able to produce several Watts of output power. Extending the output power to a higher level would probably require another driver stage after the oscillator.